• Support 52 storage cards(SD、Micro SD、MII、CF ……etc.). • Support bank card ATM and SIM card with SIM Chip; read-write memory cards. • Support high speed SDHC(8~32G). • Compatible the most updated Windows up to Windows Vista. • Certificate fireproof material green and Pcba RoHs(CE、FCC、BSMI) formal. • Designed to fit in Models PC 3.5. • Support High-speed(480Mbps) and Full-speed(12Mbps) Data transfer. • Support SDHC(8~32G) data traffic. • Support Archie：Windows 98/98SE/2000/ME/XP/Vista，Mac OS 8.X/9.X/10.X，Linux2.4. • SD SLOT：SD /MMC/ MS/DXC. • Micro SD SLOT：Micro SD/MII，T-Flash. 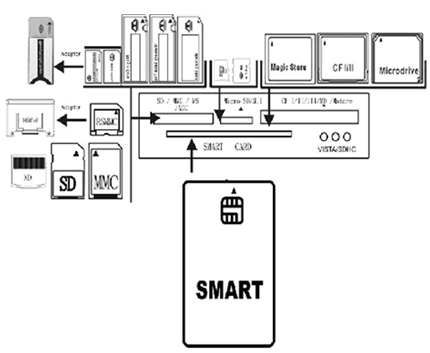 • Smart SLOT：Chip IC Card(Smart/SIM). • SD Slot and Micro SD Slot not coincide，other support data change. • Designed as easy to install with Models PC 3.5”. XD Picture -card Type M，XDPicture -card Type H.
complementarity counts or IC Card Nslookup. SIM card adaptor：mobile phone SIM compile read-write memory. Support hardware ECC(Error Correction Code) function. Support hardware CRC(Cyclic Redundancy Check) function. Support CF v4.0 16bit data with PIO mode 6 and Ultra DMA mode.